Thanksgiving is right around the corner, which means that Cyber Monday is also quickly approaching. Cyber Monday is a great opportunity for gamers to find the best deals on gaming consoles, popular games, accessories, and other electronics without having to leave the comfort of their own home. Many physical stores that are participating in Black Friday, such as GameStop, are also discounting their games online on November 26th for Cyber Monday. GameStop is taking it to the next level by holding a CyberWeek, offering a week’s worth of deals from November 27th to December 1st. 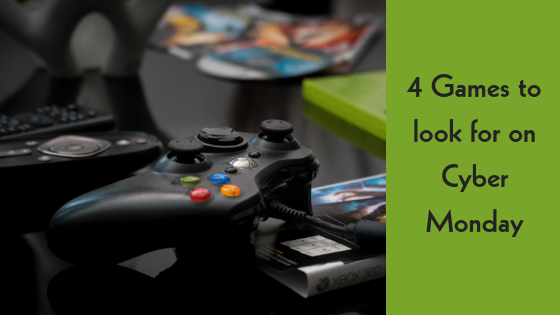 GameTruck Jacksonville has 4 recommended games that you should look for this Cyber Monday. Monster Hunter World is one of the best action role-playing games to keep an eye on for Cyber Monday. With its early release in January of this year, this game has been said to be the second-best selling video game for the PlayStation 4. Gamers can hunt and trap the scariest monsters on PS4, Xbox One, or on their PC’s. GameTruck Jacksonville has already seen this game lower in price, so we believe this game will be one of the best-priced games this holiday season. Far Cry 5 is the latest installment of the popular first-person shooter video game. The game has been praised for its design, visuals, and soundtrack. This game is available for the PlayStation 4, Xbox One, and Microsoft Windows. Currently retailed around $60, we expect this game to see a significant drop in price due to its earlier release in March of 2018. Online retailers such as Amazon, BestBuy and GameStop are expected to sell these games on Cyber Monday. Whether its Tom Brady or Khalil Mack, you can play the field as your favorite NFL pro in Madden NFL ‘19. With interactive touchdown interactions and a great soundtrack, Madden ‘19 has new and improved features that gamers seem to love. This game was given an 8.9 rating by IGN, so be sure to get this game while discounts last. As one of the best-selling games on the Nintendo Switch, Octopath Traveler is a single-player adventure video game. Allowing you to choose from eight characters, gamers can experience this game through multiple stories and embark new challenging journeys. Check out these online retailers for the best prices this Cyber Monday. GameTruck’s goal is to deliver excitement to all of your events. With a variety of games and consoles provided, we make sure to have the latest games to keep you and your guests entertained. Review GameTruck’s pricing and availability here, or call us at (866) 253-3191.